On July 12, 2015, the Guatemalan Centre for Environmental and Social Legal Action (CALAS) filed criminal charges against former Minister of Energy and Mines, Erik Archila, and former mines director at the Ministry of Energy and Mines (MEM), Fernando Castellanos. CALAS is accusing Archila and Castellanos of violating the Constitution and of breach of duty for having granted Tahoe Resources an exploitation licence for the Escobal project without adequate consideration of more than 250 community complaints against the project. CALAS called on the UN-backed International Commission Against Impunity in Guatemala (CICIG) to fully investigate the Escobal licensing process, citing Archila's possible involvement in influence trafficking and illicit enrichment. 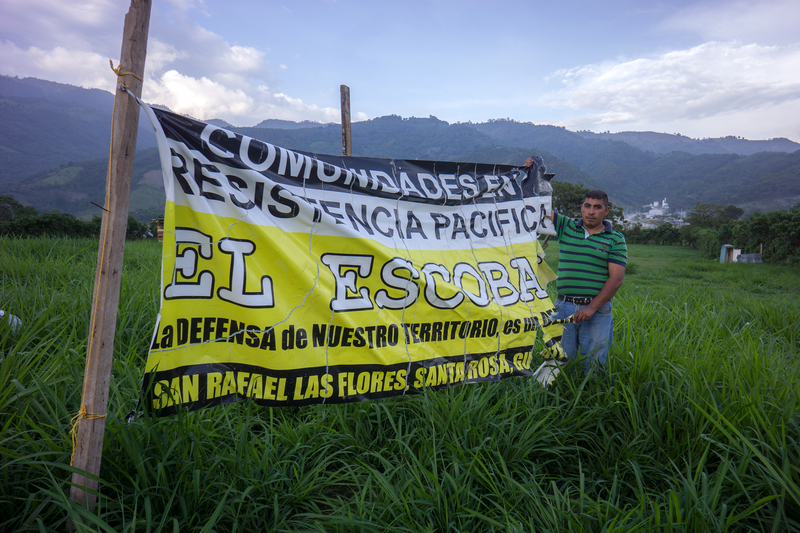 CALAS’s complaint reflects ongoing and widespread opposition to mining in Santa Rosa and Jalapa, which the government and company alike have ignored. Beginning in December 2011, more than a year before MEM granted Tahoe Resources its licence, residents from various communities in Santa Rosa and Jalapa began filing administrative complaints against the project, according to provisions within Guatemala's mining law. The complaints, over 250 in all, expressed opposition to the project based on anticipated environmental impacts, which would violate residents' rights to water and to live in a healthy environment. According to the mining law, MEM is required to hold a hearing with the affected individual and the mining company in order to resolve each complaint. However, on April 3, 2012, less than one hour before the press conference when the approval of Tahoe’s exploitation licence was announced, all of the complaints were dismissed. CALAS argues that the Escobal licence was therefore granted illegally and in violation of constitutional rights. In May 2013, they initiated legal proceedings to repeal MEM's decision. On July 23, 2013, the Civil and Mercantile Division of Guatemala's First Court of Appeals decided in favour of the communities, upholding the appeal and putting the legality of the Escobal exploitation licence in question. Tahoe Resources' Guatemala subsidiary Minera San Rafael appealed the decision, sending the case to the Constitutional Court. A final decision is pending. The recent charges come in the wake of an ongoing political crisis in Guatemala sparked by joint CICIG and Public Prosecutor investigations that revealed rampant corruption in the social security and customs offices, as well as in the judicial system and Congress. So far, 42 people, including President Molina's former personal secretary, his general secretary, and the head of the national bank, have been arrested. Vice President Roxana Baldetti resigned on May 8 under suspicion of illegal enrichment and Congress is considering stripping Otto Perez Molina of his presidential immunity. Former Mines and Energy Minister Erick Archila resigned on May 15 and is facing allegations of corruption, money laundering, and anomalies in the granting of numerous government contracts.